Keyboard Prep is a contemporary comprehensive keyboard/piano and musicianship course for students ages 8 to 10 (third through sixth graders). There are three books – 18 week semester for each book and classes meet 55 minutes weekly. A parent/caregiver also attends the class and provides at home support in many activities. This age group loves to perform for their peers and gains confidence in their skills by leading the class in playing and singing activities. There are many opportunities for parents/caregivers to be involved in team play, relay play, and ensemble activities. 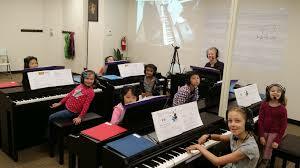 We hope that music activities first experienced in class will become an important part of the family time at home.